A black and white portrait of Mrs. Seth Hubbell (Rachel Almira Kellogg). 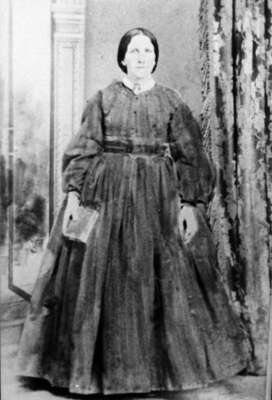 Mrs. Seth Hubbell (Rachel Almira Kellogg) (1834-1911) was born at Haldimand Township, Upper Canada on November 1, 1834. On August 20, 1851, she and Seth Hubbell were married at Whitby Township, Canada West. She died at Elk Rapids, Michigan, USA on September 23, 1911 and is buried at Maple Grove Cemetery, Elk Rapids, Michigan.